Early fall is the season of apples for me, and I get excited to use all kinds in every way possible. So, when Brent suggested we try to create our own Waldorf salad–in which apples are a main ingredient–I was completely on board. The original Waldorf salad recipe is attributed to the dinning room manager of New York’s Waldof-Astoria Hotel in the late 1890s. It contained apples, celery, and mayonnaise, and was served on a bed of lettuce. Soon thereafter, walnuts became another main ingredient and over the decades other ingredients have come and gone. Some common additions are chicken, turkey, dried fruits, and yogurt. 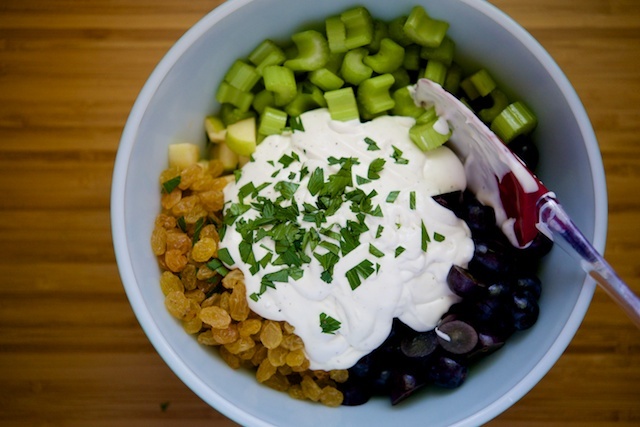 I imagine that yogurt plays an integral role in helping the dressing stay light and flavorful. So, I wanted to recreate that experience, but keep it dairy-free. This Waldorf salad is sweet and light, and can be served as a refreshing lunch, appetizer, snack or even dessert. (Yes, I said dessert. I had the leftovers as “dessert” for three straight dinners.) We hope you will enjoy it, too! To make the dressing, stir together the coconut milk and apple cider vinegar in a small bowl. Then, mix in the mayonnaise, lemon zest, salt, and pepper. Set aside to rest. Place apples, celery, raisons, and grapes in a large bowl. Add the parsley and dressing, and toss until everything is coated with the dressing. Refrigerate for at least 30 minutes, up to 24 hours. Mix in the walnuts and spoon onto a lettuce leaf just before serving. 1. To make the dressing, stir together the coconut milk and apple cider vinegar in a small bowl. Then, mix in the mayonnaise, lemon zest, salt, and pepper. Set aside to rest. 2. Place apples, celery, raisons, and grapes in a large bowl. 3. Add the parsley and dressing, and toss until everything is coated with the dressing. Refrigerate for at least 30 minutes, up to 24 hours. 4. Mix in the walnuts and spoon onto a lettuce leaf just before serving. This sounds lovely, I love a crunchy salad with loads of flavour which this is. Oh I am so making this to take in my lunch next week!!!!!!!!!!!!!!!!!!! Thank you for sharing. I enjoy your posts so much.